INTERESTED IN PLAYING JUNIOR HOCKEY in 2019? Join the Ryde-Hunters Hill Hockey Club! Competitions run from late March to early September and games are played Friday nights and Saturday mornings on artificial turf pitches. If you, or your child are intending on trialling for a Junior or Minkey (U9) team for the 2019 season please register your details in the respective form below. Learn basic skills through fun games and activities. Please complete the Junior Intention to Trial form (link above) if you are intending to trial for a Ryde Junior team this year. This will allow us to allocate bib numbers, groups, etc before the trial night to get the kids on the field quicker. You will still need to complete the online club registration at a later date. Junior Grading/Training times for 2019 – to commence Monday 18th February 2019. Grading will be held for 2 weeks. 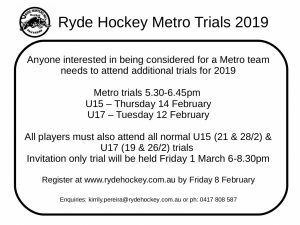 Players interested in trialling for a Metro team need to attend additional trials in 2019. All players will also need to attend the normal Junior Grading sessions listed above. An overview of an exciting new program being run at Ryde Hockey Club to introduce more 5-9 year olds to the sport of hockey.